Who's the next resin bust in the Superman series? Darkseid is! The legendary ruler of Apokolips arrives in his animated form in advance of his Justice League film appearance, with this bust based on his appearance in classic Superman: The Animated Series episodes. 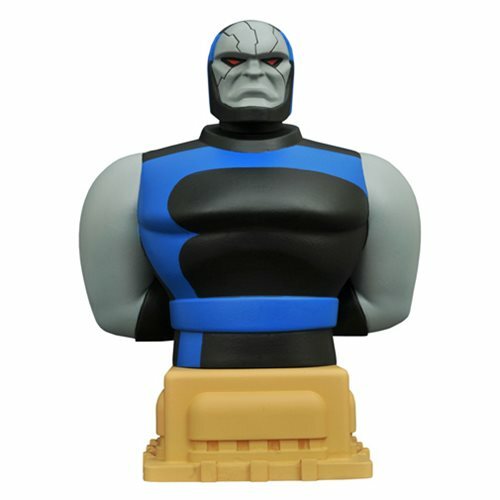 Posed in an intimidating fashion atop a Metropolis architectural pedestal, this approximately 6-inch tall resin bust is the perfect addition to your DC Animated Universe bust collection. The bust is a limited edition of only 3,000 pieces and comes packaged with a certificate of authenticity in a full-color box. Sculpted by Varner Studios. Ages 13 and up.